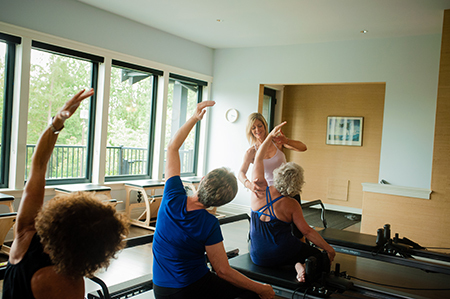 Benefits of Pilates - CoreBody Pilates + Yoga Inc.
Pilates teaches diaphragmatic breathing (belly breathing) to help clients achieve a deeper level of pelvic floor connectivity attaining a parasympathetic nervous system state which allows the body and muscles to release as well as engage within a relaxed state. We encourage clients to find a neutral spinal alignment or as close to as they physically can with props and padding. Our goal is to help you learn the importance of supportive posture, a neutral spine, and to build one’s proprioception as to where you may sit in space. Your physical build (hereditary) and lifestyle (you sit at a desk all day) will effect your posture. 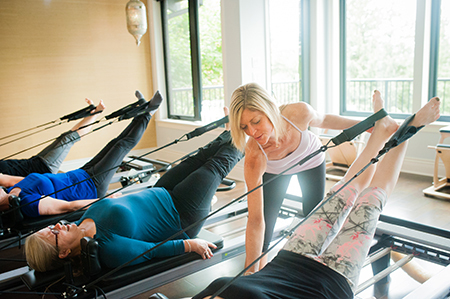 Pilates helps to build both front and back-body support with a focus on both abdominals and back strength. 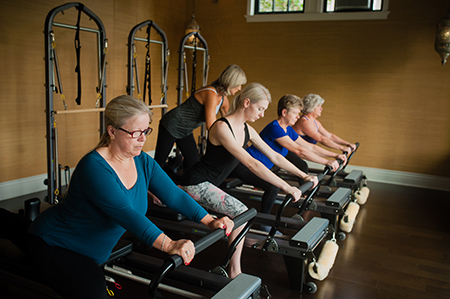 Spring-based pilates work on the machines; reformer, cadillac and chair allows clients to work eccentrically which lengthens and elongates the muscles at the same time as you are strengthening the muscles. Weight based training traditionally builds muscles concentrically which shortens them, so the eccentric spring-based training of apparatus (machine-based work) allows clients to work both concentrically + eccentrically, lengthening these muscles. Conventional workouts tend to build short, bulky muscles. However, a body with balanced strength and flexibility is less likely to be injured as pilates trains muscle groups evenly, conditioning your whole body.